What would Thanksgiving be without Hot and Sour Soup? Such is the tradition in our family . . .
It’s funny how traditions get started and then how they get maintained. As a family grows, you come to develop your own rituals and quirks. We celebrate birthdays in the morning, for instance, by waking the birthday person up early singing and bearing tea, breakfast in bed and presents. True – it is slightly tormenting – but sweet! Over the years, when the kids were young and we were all living in the same state, we figured out how and where to celebrate different holidays, delegating Thanksgiving to Lummi Island at my in laws up on Lummi Island and Easter to Whidbey Island at my parents. (Were we spoiled or what?!!) Both developed into unique and festive extended family occasions with certain ritual traditions. Hot and Sour Soup on Thanksgiving Eve became one of those cherished traditions. It was started many years ago by my father-in-law, Howard. Howard had an interesting life, growing up one of 14 kids on a farm in Pennsylvania and ending up on six acres of forest on a tiny island, Lummi Island, in the Pacific Northwest. He made his way on the island as handy man and house remodeler, and was plenty busy taking care of his customers, but he always a few other interests going as well, such as building his own home from the ground up, and he wasn’t afraid to start learning something new. Well into his middle age he took up saxophone, for instance, and for a while studied and grew bonsai trees. Then there was his stint as a volunteer fireman and his hobby for fixing up old cars, which ultimately led to converting an old shed to a complete paint shop and resulted in a gorgeous poppy orange fully converted 1965 mustang. And so it came to be that each year as we approached Thanksgiving, we’d beg Howard “Please make Hot and Sour Soup again!!!! We have to have it! !” For truthfully, even though we would always also have a gorgeous traditional Thanksgiving feast – it was our secret favorite part. Thanksgiving Eve had to start with Hot and Sour Soup and then after all the gorging was over, the perfect night cap was a little bowl of Hot and Sour Soup to end it all too. Howard passed away in August several years ago now (although he still visits me in my dreams from time to time), and I remember as we were approaching Thanksgiving that year, it suddenly dawned on me that he wouldn’t be there to make the Hot and Sour Soup! – a small thing, I know, but somehow important. I realized that this had become a beloved tradition in our family and the baton had to be passed along. If we waited too long, his recipe might be lost. I called Sandy on the spot and asked her did she know where Howard kept his recipe for Hot and Sour Soup because I wanted to carry on the tradition and make it. She thought she did and hunted through the kitchen announcing she had it along with his notes from his different trials and errors. She started reading and I realized I didn’t even have a paper and pen handy. I grabbed the nearest thing I could find – a bank deposit envelope – and furiously began scribbling as Sandy looked through his books and notes. I ran out of space and had to open the envelope up and keep writing on the other side. Sandy and I cried as we interpreted and copied his notes, but it was a good cry . . .
That year, and every year since, I’ve made Howard’s Hot and Sour Soup–adding a couple touches of my own and now making a vegetarian version too. I keep thinking I should transcribe the notes I took that day – but I can never do it. I love that tear water and food stained bank envelope. It captures perfectly that moment of realizing we had to continue Howard’s tradition and invites me to intentionally pause to remember all the little things about him and about that era when the whole extended family got together – before we got relocated across the country, before the kids grew up and went away to college, before Howard died. 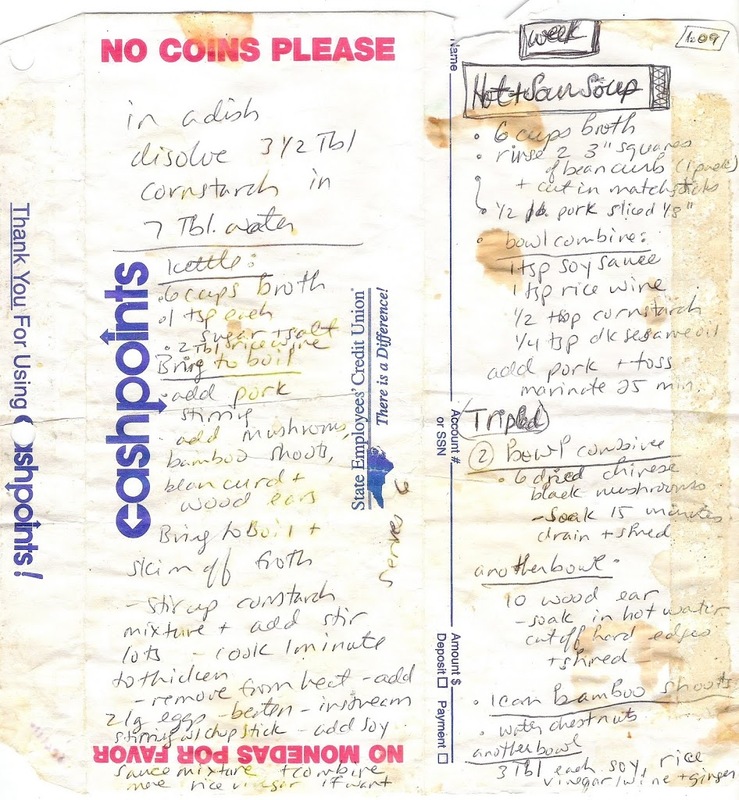 A note about the ingredients in this recipe. There are really only 3 unusual ingredients in this recipe: chinese black mushrooms or shiitake, wood ears (another mushroom) and Tiger Lily buds all of which you can find at an asian grocery. Tiger Lily’s are the only ingredient that you probably have to go to an oriental grocery store for. Usually you can find the dried black mushrooms or shiitake and the wood ears at a store like Whole Foods. You can make this without the Tiger Lily buds. You will need several bowls for combining different portions of this recipe.